National Hunting and Fishing Day is Saturday, Sept. 22. New Mexico celebrates with statewide FREE FISHING for the day. All residents and nonresidents can fish public waters without a license. All other rules and regulations apply. Great day to take a friend fishing! Abiquiu Lake: Peyton Lapka, age 10, of Albuquerque caught a 3.5-pound smallmouth bass Sept. 16. He was using a top water lure. Alto Lake: Carlos Huerta of Tucson, Arizona caught a 14-pound channel catfish Sept. 10. He was using a live crawdad. 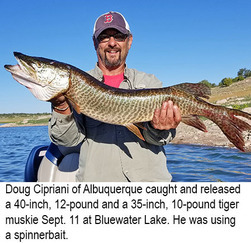 Bluewater Lake: Doug Cipriani of Albuquerque caught and released a 40-inch, 12-pound and a 35-inch, 10-pound tiger muskie Sept. 11. He was using a spinnerbait. Chama River: Frank Garcia of Albuquerque caught and released a 20.5-inch brown trout Sept. 16. He was using a night crawler. 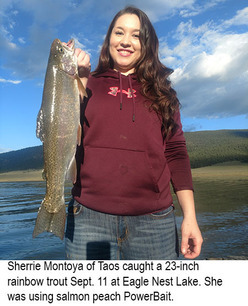 Eagle Nest Lake: Sherrie Montoya of Taos caught a 23-inch rainbow trout Sept. 11. She was using salmon peach PowerBait. 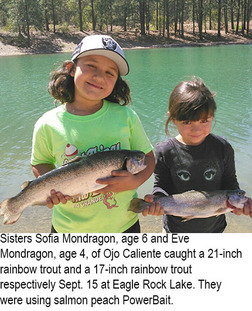 Eagle Rock Lake: Sisters Sofia Mondragon, age 6 and Eve Mondragon, age 4, of Ojo Caliente caught a 21-inch rainbow trout and a 17-inch rainbow trout respectively Sept. 15. They were using salmon peach PowerBait. Elephant Butte Lake: John Clayman of Albuquerque caught and released an 8.78-pound largemouth bass Sept.15. He was fishing in McRae Canyon and using a green/gray tube. Fenton Lake: Louise DeHart of Corrales caught a 20-inch rainbow trout Sept. 10. She was using orange PowerBait. Greene Acres Lake: David Baker of Clovis caught a 26-inch channel catfish and a 24-inch carp Sept. 11. He was fishing at night and using hot dogs. 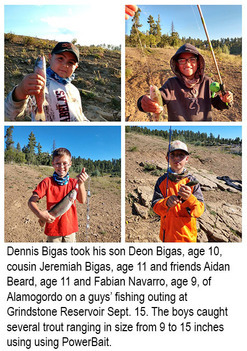 Grindstone Reservoir: Dennis Bigas took his son Deon Bigas, age 10, cousin Jeremiah Bigas, age 11 and friends Aidan Beard, age 11 and Fabian Navarro, age 9, of Alamogordo on a guys’ fishing outing Sept. 15. The boys caught several trout ranging in size from 9 to 15 inches. They were using PowerBait. Peralta Drain: Pablo Griego of Los Lunas caught and released several northern pike over 20 inches on Sept. 11. He was using wacky worm rigs and small spinners. Roswell Kids Pond: Avery Knight, age 7, of Roswell caught a 7-pound channel catfish Sept. 14. He was using stink bait. San Juan River: Diego Silva of Belen caught and released a 20-inch rainbow trout Sept. 12. He was using a custom tied fly. Ute Lake: Greg Dudley caught a 4-pound largemouth bass Sept. 10. He was fishing at night and using a custom-made grub. Fenton Lake: Matt Chavez of Rio Rancho caught a 21-inch rainbow trout Sept. 7. He was using a black leech. Andrew Gallegos, age 11, of Albuquerque caught a 17-inch rainbow trout Sept. 8. He was using salmon eggs. Seven Springs Brood Pond: Lucas Guerrero, age 3, of Albuquerque caught an 18-inch rainbow trout Sept. 2. It was his first fish and he was using salmon eggs. Paige Dilworth, age 8, of Tijeras caught an 18-inch rainbow trout Sept. 8. She was using salmon eggs. Blue Hole Park Pond: Fishing was fair using worms, salmon eggs and PowerBait for trout. A few catfish were caught by anglers using worms, PowerBait and hot dogs. Charette Lakes: Fishing was slow to fair using PowerBait for trout. Cimarron River: Stream flow near the town of Cimarron on Monday morning was 25.9 cfs. Fishing was good using stimulators, prince nymphs, San Juan worms, salmon eggs and worms for trout. Trout fishing at the Gravel Pit Lakes was good using Pistol Petes, PowerBait, Fire Balls and worms. Clayton Lake: Fishing was fair to good using PowerBait, worms and salmon eggs for trout. We had no reports on other species. Conchas Lake: Fishing was good using swim jigs, ned rigs, wacky worms, chatter baits and tubes for largemouth bass and smallmouth bass. Fishing was good using shrimp, cut bait, night crawlers and chicken liver for catfish. Fishing was fair to good using slab spoons and blade baits for white bass. Fishing was fair to good using worms for bluegill. We had no reports on other species. The surface water temp was in the low to mid 70s. Costilla Creek: Stream flow on Monday morning below Costilla Dam was 2.52 cfs. We had no reports from anglers this week. Cowles Ponds: Fishing was good using PowerBait and salmon eggs for trout. Eagle Nest Lake: Fishing was very good using white honey worms, PowerBait and worms for perch. Fishing was good using orange and salmon peach PowerBait and trolling wedding rings and Platte River specials tipped with PowerBait or corn for rainbow trout and kokanee. Fishing for northern pike was slow to fair using streamers, crank baits and Platte River specials. The surface water temp was in the low to mid 60s. Eagle Rock Lake: Fishing was good using chartreuse, orange and salmon peach PowerBait, Fire Balls, copper John Barrs and Pistol Petes for trout. Fawn Lake: We had no reports from anglers this week. Gallinas River: Fishing was fair to good using copper John Barrs, mop flies, San Juan worms, salmon eggs and worms for trout. Daryl West reported catching three rainbow trout last Thursday. He was using a mop fly. Hopewell Lake: Fishing was slow to fair using worms and PowerBait for trout. Lake Maloya: Fishing was good using PowerBait, worms, small spoons and Pistol Petes for trout. Los Pinos River: Fishing was good using mop flies, worms and salmon eggs for trout. Monastery Lake: Fishing continued to be very good for anglers using PowerBait, salmon eggs, worms and small spoons for trout. Pecos River: Stream flow near the town of Pecos on Monday morning was 33.6 cfs. Fishing was good using copper John Barrs, small gold Panther Martins, salmon eggs, PowerBait and night crawlers for brown and rainbow trout. Fishing was fair using night crawlers and hot dogs for catfish. Red River: Stream flow below the hatchery on Monday morning was 29.5 cfs. Trout fishing was good using mop flies, Fire Balls, night crawlers and PowerBait. Rio Grande: Stream flow on Monday morning at the Taos Junction Bridge was 143 cfs. Trout fishing was good using mop flies, black wooly buggers, San Juan worms, copper John Barrs, poundmeisters, Panther Martins and night crawlers. Anglers using wooly buggers also reported catching and releasing a good number of smallmouth bass. We had no reports on other species. Rio Mora: Stream flow near Terrero on Monday morning was 17.2 cfs. Fishing was good using worms and Fire Balls for trout. Rio Pueblo: Stream flow near Penasco on Monday morning was 5.37 cfs. Fishing was slow to fair using worms for trout. Storrie Lake: Fishing continued slow for all species. Fishing pressure was very light. Ute Lake: Fishing was very good using worms, tubes, minnows and grubs for bluegill. Fishing was good using shrimp, night crawlers and chicken liver for catfish. Fishing was fair using senkos, tubes, chigger craws and curly tail grubs for largemouth bass and smallmouth bass. Most of the smallmouth bass were 13 inches or less. Fishing for white bass and walleye was slow with just a few white bass caught by anglers using spoons. The surface water temp was in the mid 70s. Abiquiu Lake: The lake level remains low and anglers should use extreme caution when launching boats. Four-wheel drive vehicles are recommended for launching. Much safer launching would be with canoes or kayaks. Fishing was fair using top water lures, senkos, tubes, spinner baits and crank baits for smallmouth bass. We had no reports on other species. Animas River: Water flow below Aztec on Monday morning was 5.13 cfs. We had no reports from anglers this week. Albuquerque Area Drains: Fishing on the Peralta Drain was good using small spinners and worms for largemouth bass and northern pike. We had no other reports. Bluewater Lake: Fishing was fair using swim baits, spinnerbaits, large streamers and crank baits for tiger muskie. We had no reports on other species. Canjilon Lakes: Trout fishing was fair to good using PowerBait, worms, Pistol Petes and spinners. Chama River: Monday morning flows below El Vado and Abiquiu were 604 cfs and 468 cfs respectively. Trout fishing below El Vado was fair to good using night crawlers, San Juan worms, copper John Barrs and zebra midges for brown and rainbow trout. We had no reports from below Abiquiu. Cochiti Lake: Fishing was fair to good using crank baits, spoons and spinners for white bass. Fishing was fair using shrimp and chicken liver for catfish. Fishing was fair using ned rigs, chatter baits, spinnerbaits and senkos for smallmouth bass and largemouth bass. We had no reports on other species. Fenton Lake: Fishing was fair to good using yellow small midge patterns, orange, yellow and salmon peach PowerBait, salmon eggs and worms for trout. The best reports came from anglers using flies. Heron Lake: The La Laja boat ramp is open but anglers are advised to use extreme caution launching boats. Most off-shore activity has been from canoes and kayaks. Fishing was slow with a few rainbow trout caught by anglers drifting PowerBait. The shoreline is quite murky from the low water conditions. Jemez Waters: Stream flow on the Jemez near the town of Jemez on Monday morning was 7.44 cfs. Trout fishing on the Jemez and the East Fork was very good using worms, elk hair caddis, mop flies, worms and salmon eggs. Fishing on the upper and lower Cebolla was fair to good for anglers using mop flies, San Juan worms, copper John Barrs and worms. One angler reported catching and releasing several brown trout on the lower Cebolla. He was using copper John Barrs. Fishing on the San Antonio was good using copper John Barrs, Fire Balls and worms for trout. Laguna del Campo: Fishing was fair using PowerBait and Fire Balls for trout. Navajo Lake: Fishing was fair using spinnerbaits, crank bait and swim baits for northern pike. Fishing was good using chatter baits, senkos, crank baits, curly tail grubs and finesse worms for smallmouth bass and largemouth bass. Fishing was fair to good using worms and curly tail grubs for perch. Fishing was good trolling Arnies and Panther Martins tipped with PowerBait or corn for kokanee. Fishing was fair to good using worms for perch. We had no reports on other species. San Juan River: Stream flow below Navajo Lake was reduced on Monday afternoon to 769 cfs. Fishing was good using hoppers, zebra midges, red annelids, RS2s and Griffiths gnats for brown and rainbow trout. Through the bait waters, fishing was fair to good using jerk baits, hoppers, mop flies, San Juan worms, copper John Barrs, worms and salmon eggs. Seven Springs Brood Pond: Fishing was good using salmon eggs, PowerBait and worms for trout. Tingley Beach: Fishing was fair to good using hot dogs, homemade dough baits, shrimp and worms for catfish. We had no other reports. Trout Lakes: Fishing was very good using PowerBait and Fire Balls for trout. Bill Evans Lake: We had no reports from anglers this week. Caballo Lake: Fishing was fair using slab spoons and curly tail grubs for white bass. Fishing was fair using liver and punch bait for catfish. We had no reports on other species. Elephant Butte Lake: Fishing was very good using slab spoons, blade baits, grubs, minnows and crank baits for white bass. Fishing was good using tubes, senkos, creature baits, ned rigs, chatter baits and spinnerbaits for largemouth bass and smallmouth bass. Fishing was fair using crank baits, tubes and swim baits for walleye. Fishing was good using liver, hot dogs, homemade dough bait, cut bait and shrimp for catfish. We had no reports on other species. Escondida Lake: Fishing was fair using night crawlers, hot dogs and homemade dough bait for catfish. Gila River: Stream flow on Monday morning was 59.9 cfs. We had no reports from anglers this week. Glenwood Pond: Fishing was good using salmon eggs and PowerBait for trout. Lake Roberts: Fishing was good using worms and PowerBait for trout. We had no reports on other species. Percha Dam: Fishing was fair using night crawlers, shrimp and beef liver for catfish. We had no reports on other species. Rancho Grande Ponds: Fishing was slow for all species. Rio Grande: Stream flow below Elephant Butte Monday morning was 650 cfs. Fishing was good using liver, hot dogs and night crawlers for channel catfish. Fishing was slow to fair using tubes, swim baits and curly tail grubs for white bass and walleye. We had no reports on other species. Alto Lake: Fishing was very good using worms and hot dogs for catfish using PowerBait and worms for trout. Fishing was fair to good using PowerBait, worms and salmon eggs for trout. Anglers using worms also reported catching a few small bass. We had no reports on other species. Black River: Stream flow at Malaga on Monday morning was 4.91 cfs. We had no reports from anglers this week. Brantley Lake: Fishing was good using ned rigs, tubes, spinnerbaits, crank baits, swim baits and chatter baits for largemouth bass and white bass. We had no reports on other species. Green Meadow Lake: Fishing was fair using homemade dough bait, liver and hot dogs for catfish. Greene Acres Lake: Fishing was slow with just a few catfish caught by anglers using chicken liver and hot dogs for catfish. We had no reports on other species. Grindstone Reservoir: Fishing was good using salmon eggs, worms, PowerBait and olive Pistol Petes under a bubble for trout. We had no reports on other species. Jal Lake: Fishing was slow for all species. Lake Van: Fishing was slow to fair using hot dogs and liver for catfish. We had no reports on other species. Pecos River: Stream flow below Sumner Lake on Monday morning was 78.9 cfs. Fishing below Sumner Lake was slow. Fishing pressure was light. Perch Lake: Fishing was slow, but a few catfish were caught by anglers using hot dogs, night crawlers and shrimp. We had no reports on other species. Ruidoso River: Stream flow on Monday morning at Hollywood was 6.10 cfs. We had no reports from anglers this week. Santa Rosa Lake: Fishing was fair to good using spinner baits, chatter baits, swim baits, tubes, jigs, senkos and creature baits for largemouth and smallmouth bass. Anglers fishing for bass also reported catching a few walleye. We had no reports on other species. Sumner Lake: Fishing was fair using cut bait and chicken liver for catfish. The best reports came from anglers fishing at night. Fishing was slow to fair using ned rigs, tubes and creature baits for largemouth bass and smallmouth bass. We had no other reports.